The Next Generation Protein: We have taken protein supplementing to the next level, without the worry of wasting ingested protein. The addition of NitroZyme helps breakdown long and short chain amino acids into smaller, more readily absorbable amino acids for maximum absorption. ** NitroZyme helps the body release more amino acids directly into the muscles to increase muscle size, strength and lean body mass. 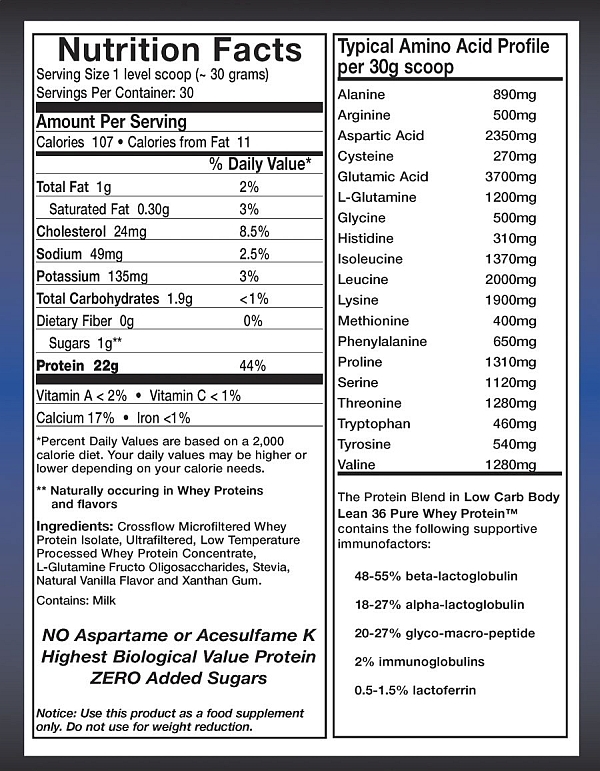 Added L-Glutamine: Low Carb Body Lean 36 Pure Whey Protein also contains 1000mg of L-Glutamine (in addition to naturally occurring L-Glutamic acid) per serving to assist athletes in increasing their recovery time following exercise.